Amanda here – it’s been a while since my last post – but I think you will enjoy this one. For those of you who don’t know, when I’m not at the gallery, I am at Concordia University working on my Master’s degree in Art History – which means that I spend A LOT of time researching and writing. This semester I had the pleasure of taking a seminar on Inuit Art. As with most Art History seminars, we were tasked with writing a research paper on a topic relating to the class, but had carte blanche on the subject. 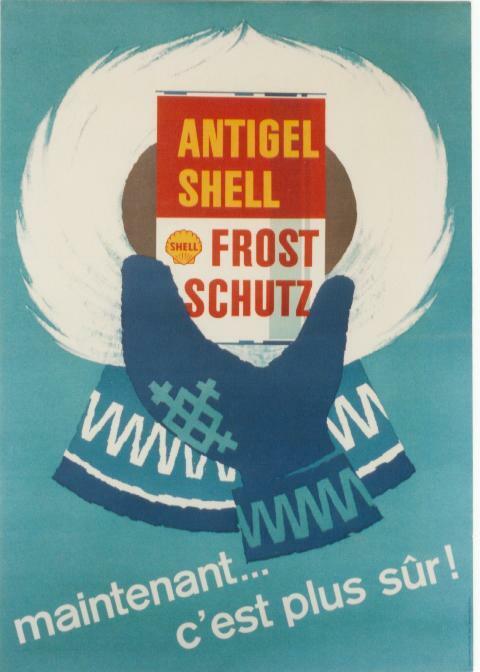 I decided to combine “work-work” with “school-work” and write my paper about posters; more specifically, posters and advertisements that feature stereotypical representations of the “Eskimo” as a marketing technique. I am presenting to you here some of my findings in abridged form. Throughout my research, I found that these types of images are very easy to locate. They were literally everywhere; especially from 1900-1960. 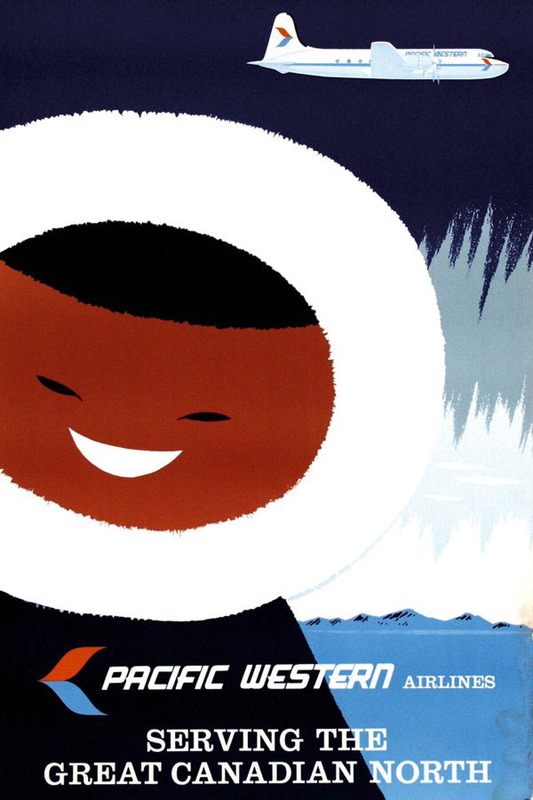 The prolific use of representations of the “Eskimo” as exotic “Other” in popular culture and advertising suggests that these representations were viewed as an effective marketing strategy and that these types of images were very well received by southern audiences. I have identified four types of images that draw on stereotypical representations of the “Eskimo” as exotic “Other”. They are; (1) the “Eskimo” represented as cute, sweet or innocent, (2) the “Eskimo” as a stand in for cold temperatures (these are usually advertisements for products such as ice cream, refrigerators and air conditioners, etc. 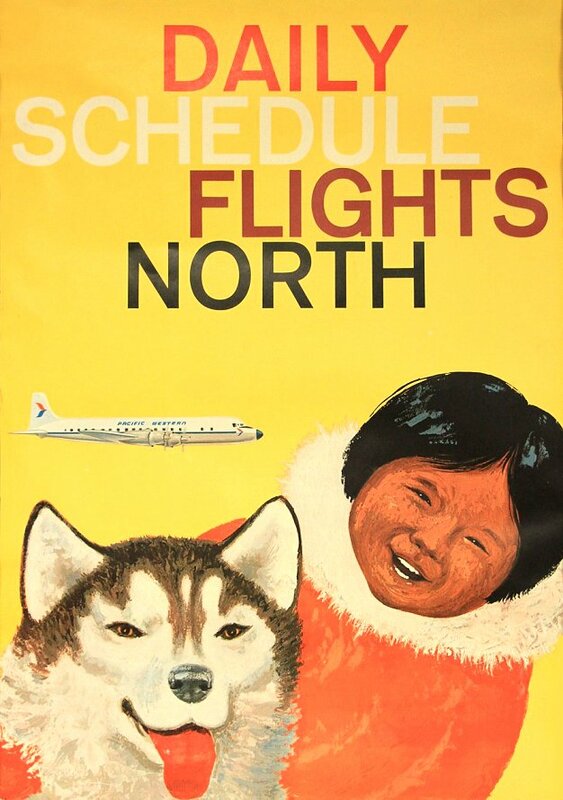 ), (3) the “Eskimo” as savage or violent (this image is usually used in relation to movies and movie posters) and finally (4) the “Eskimo” as a representative of exotic “Other” as an incentive to promote travel (these image most commonly take the form of airline posters). Here is a selection of some of the images that I looked at in my paper. 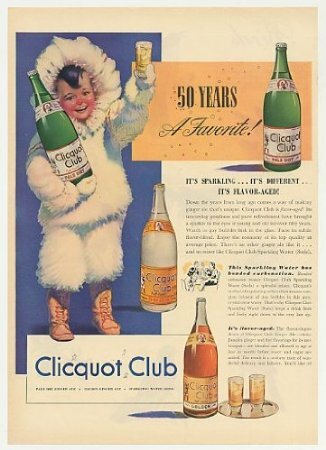 As an example of the “cute, sweet or innocent” representation of the “Eskimo,” I looked at a selection of ads for a soda company called Cliquot Club. This company was founded in 1885 by a man named Henry Millis in what is now Millis, Massachusetts. Named after the famous French champagne, Veuve-Clicquot, the Clicquot Club Company originally produced a brand of sparkling cider. They became famous however for their flavored sodas, notably their ginger-ale and a drink called Eskimo-Up (various auction listings for old cans of Eskimo-Up indicate that the soda was citrus flavored, probably similar to what we know today as 7-Up). In 1901 the company was sold to Horace Kimball and his son, whom began aggressively marketing the brand, making use of the company’s logo, “Eskimo Boy”. The smiling “Eskimo Boy” was featured on every bottle, crate and advertisement for the company. … or these Eskimo Pie Ads. Eskimo Pie is a patented brand name for chocolate covered ice cream bars. First invented by a Danish candy-store owner by the name of Christian Kent Nelson in Iowa in the 1920’s, the trademark for this product is currently owned by Nestlé and is still produced under the name “Eskimo Pie”. 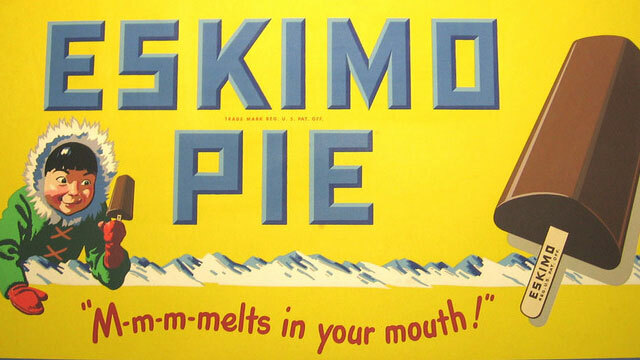 By 1922, 1 million Eskimo Pies were being sold each day in the United States (Steckley, 13) and the product continues to be received favorably around the world (although I have never seen the product in Canadian stores). 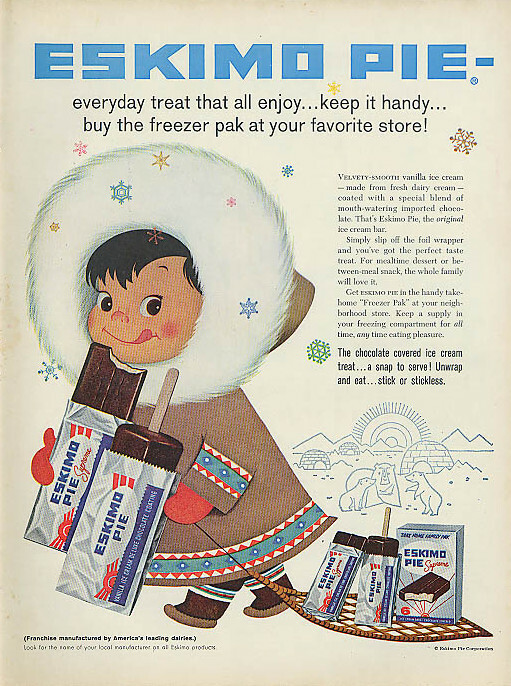 Eskimo Pie brand ice cream not only uses the now questionable term “Eskimo” in its name, but also features a cute smiling “Eskimo” child as its mascot. In the 1960s, consumers could receive a mail-order plush doll of the Eskimo Pie mascot along with a number of other similar products. 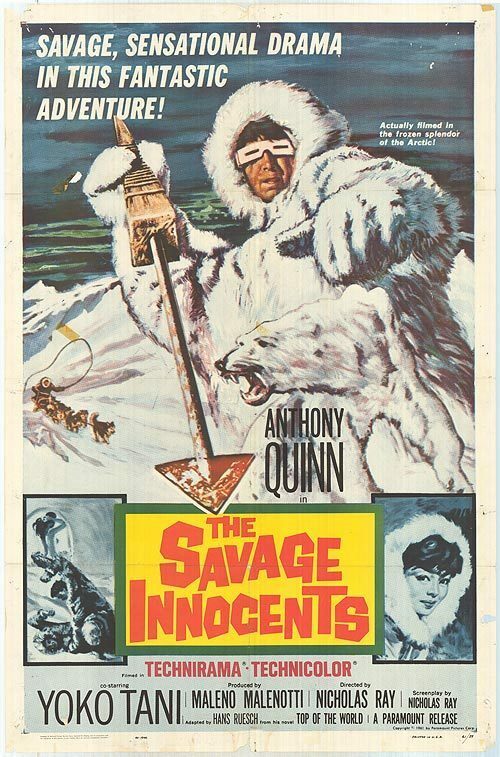 There are also movie posters, such as this one for a movie called The Savage Innocents from 1959 starring Anthony Quinn. And finally, the ever popular travel poster. These are two examples I was able to locate from the 1960s for Pacific Western Airlines. These images represent a small fraction of what has and continues to circulate. They are images that generalize, typify or stereotype Inuit Peoples, transforming them into the exotic “Other”, into the “Eskimo” as constructed or imagined by southern audiences. I began this project simply wondering, why? Why do these images exist and how did they come to be? After several weeks of engaging with such images, I came to realize that simply identifying them as racist, stereotypical or problematic was an insufficient treatment of the material, and therefore began to investigate a more constructive way of approaching stereotypical images of “othered” Peoples. The rest of the paper was dedicated to establishing a theoretical framework that not only identified these images as problematic, but also that enabled their deconstruction. I felt that that it was important to first identify the types of stereotypes that circulated about Inuit Peoples, trace potential origins for those stereotypes (such as anthropological work, world’s fairs, colonial exhibitions, travelling shows) and then examine how the stereotypes were perpetuated in visual culture. By doing so, we can begin to shed light on the people behind these images; actual living people, not imagined constructions. We cannot erase these images, but we can let them stand for something other than a stereotype – for the stories of real people, their culture, and function as an entry point into larger discussions of the legacies of colonialism in the North. Lacan, Jacques. The Four Fundamental Concepts of Psycho Analysis. 1974. New York: Norton, 1981. Mitchell, W.J.T. “Showing seeing: a critique of visual culture.” Journal of Visual Culture 1 (2002): 165-180. Steckley, John. White Lies about the Inuit. Peterborough, Ontario: Broadview Press, 2008. Next But my dears, we just don’t know how to stop!